The decoration of packaging for the "fast moving consumer goods" market plays a vital role in promoting the product to the customer, as well as in carrying informative and legislative detail. Combining these roles requires commercial awareness, detailed knowledge of the relevant technologies, creative care and consideration of the effects of colours, typefaces and images which must support the brand, position the product and provide the required product "stand-out" at the point of sale. 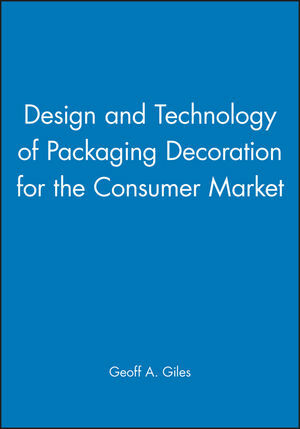 This practical handbook, written by a team of experienced industrialists and those involved in relevant, applied research, details and discusses the printing technologies and decoration formats used on the mainstream structural packaging that is found in consumer markets worldwide. The emphasis is on the technology. The volume is directed at packaging technologists and those involved in the design and development of packaging. It will also be of interest to those responsible for specifying or purchasing the decoration of packaging. Technical and commerical considerations; The printing process; Linking lithography to packaging decoration formats; Linking rotogravure printing to packaging decoration formats; Linking flexographic printing to packaging decoration formats; Linking screen printing to packaging decoration formats; Design and manufacture of labels and sleeves; Application of labels and sleeves; Direct printing / decoration on metal; Direct printing on glass; Selecting suitable decoration formats; Graphic design and the launch process; Labelling legislation and barcoding; Future decoration systems; References; Index.